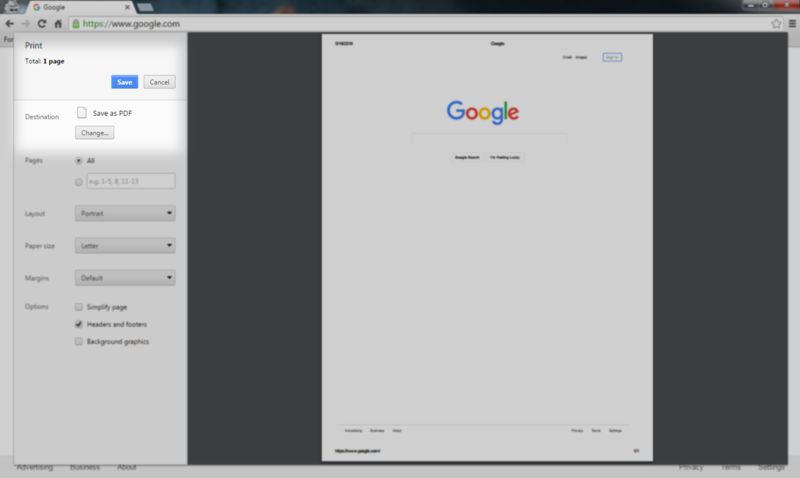 We recommend using Chrome for both Windows and MAC webpage printing. In order to print a web page wirelessly, you will need to convert the web page to a PDF. The Duquesne WebPrint system is a file printing system. Simply, that means you upload document files to http://webprint.duq.edu for printing. This can be confusing when you want to print a webpage, since a webpage is not like a Microsoft Word Document, or an Adobe PDF document. This short guide describes how to print a webpage using Chrome on any Windows computer for 7, 8, and 10. The following examples will demostrate how to save your webpage to a compatible file for the Duquesne WebPrint system, before uploading the saved file to print. Once you have saved your document you can follow the proceedure for printing wirelessly with Print Manager Plus 9.0 here. Printable PDF of the webpage conversion to PDF process.